This is Paeonia Many Happy Returns, a bright red peony variety that won’t discolour from direct sunlight. The reds of other popular red varieties like Henry Bockstoce, Red Charm and Old Faithful tend to be a darker shade. Many Happy Returns is bright, passionate red. The double-flowered Many Happy Returns attracts attention with its bright red, large flowers that can easily grow to be 17 cm in diameter. 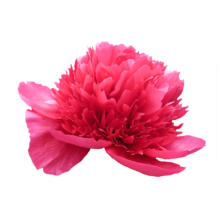 This variety has characteristics of both the anemone type and the bomb type of peonies. This variety was registered in 1986 by Hollingsworth, who also discovered Command Performance and Lorelei, siblings of Manny Happy Returns. Cut the stems diagonally 2 cm from the bottom and put Many Happy Returns in lukewarm, clean water. Add a little bit of flower food to the water and start enjoying its passionate, fiery flowers.